Gypsy moths wreak havoc, but their own enemies are not far behind. killed by the fungal pathogen Entomophaga maimaiga. ITHACA, N.Y. – If you live in a section of the country where gypsy moths are a relatively new menace, have no fear, help is not far behind. Cornell University entomologist Ann Hajek told a national conference earlier this month that when the gypsy moth – whose caterpillars have defoliated entire forests – started spreading westward more than 100 years ago from New England to Wisconsin, its fungal and viral pathogens followed close behind. The findings are important because gypsy moth populations can develop unpredictably and erratically, with lots of caterpillars eating all the leaves off of most of the trees, Hajek told attendees at the Cornell-hosted Eighth Annual Ecology and Evolution of Infectious Disease workshop and conference, June 3-4, in Ithaca. Land managers, she says, can rest assured that pathogens will follow the migrating moths, providing natural controls. Gypsy moths are slowly moving west across the United States after being introduced to Massachusetts from Europe in 1869. They migrate slowly because the females do not fly. By tracking the edges of the migration, where population densities are low, researchers have an opportunity to investigate how long it takes their viral and fungal pathogens to catch up, Hajek says. The fungal pathogen, entomophaga maimaiga, was first reported in 1989 and attacks the caterpillars. The virus, lymantria dispar nucleopolyhedrovirus, which was accidentally introduced near Boston in 1906, also infects gypsy moth caterpillars. Hajek and colleagues studied “leading edge” populations of moths and pathogens in central Wisconsin in 2005-07. They set pheromone traps west of the migrating population and then traveled east to lay traps to catch the flying males. 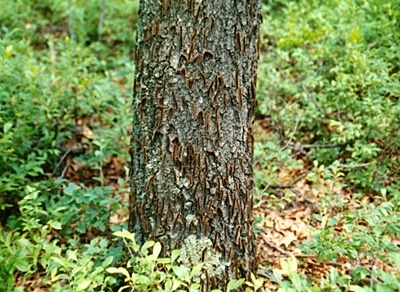 Once their traps caught more than 74 moths each in single year, there was a more than 50 percent chance of finding the fungus in that area in the following year. When more than 252 moths were trapped in a year, there was more than 50 percent chance of finding the virus the next year. “Our data show that the fungus spreads into lower density leading edge populations sooner than the virus, but the virus eventually colonizes the populations, too,” Hajek says. Fungal spores actively shoot out of the moth cadavers and disperse in the environment, thereby spreading quickly. The virus spreads from one caterpillar to another, and possibly via parasitoid flies and predators, which is a slower process, she said. Hajek has also discovered that the efforts of land managers to release the pathogens along the leading edges of spreading moth populations are ineffective and unnecessary. Hajek and colleagues found no association between the release of pathogens nearby and presence of the pathogens among the moths. “These results suggest that the pathogens are dispersing on their own and land managers don't need to release them in leading edge gypsy moth populations, because they'll get there on their own anyway,” said Hajek. The conference was sponsored by the Cornell University Center for a Sustainable Future, Institute for Computational Sustainability, National Science Foundation and Cornell.